January | 2016 | Nicholas Hoffman & Co.
Will we ever learn? I was looking at the Wall Street Journal on Thursday this past week and was surprised to see the headline “UBS Redeems Two Energy Products”. Since energy is one of the hot button topics in the market I was curious to find out what had been “redeemed”. It quickly became apparent that this was yet another story about a complex product designed by a brokerage firm. These engineered products have long been a staple of Wall Street brokers. The desire to “manufacture” products for sale to investors is just as strong today as ever, but it seems that investors never learn from the mistakes of the past. Sure enough these UBS energy products had cost investors a huge portion of their investment. Financial engineering is a polite term for creating products which make fairly specific bets in the markets. The bet in this case of redeemed energy products was a security tied to the stock price movement for oil and gas master limited partnerships (MLPs) involved in the energy pipeline business. If the pipeline companies did well, the product developed would do well. In fact the leverage in the product meant that it was designed to do twice as well as the underlying market. On the other hand the product would do twice as badly if prices fell. So when oil prices crashed, and the stock prices of MLPs plummeted, these UBS products fell twice as far. The two products both dropped by 20% on Wednesday alone, and are down 50% in value since the start of the year! UBS then made the decision to stop the carnage and announced they would redeem the two securities on February 1 for a currently undetermined price. The formal name of the security was a 2X monthly Leveraged S&P MLP Index ETN. This is a lot of inscrutable letters and abbreviations for something which turned so toxic, so fast, that the sponsoring brokerage firm felt compelled to redeem just to try to make the problem go away. The lesson to be learned here goes back to the basic blocking and tackling of investing. What are the investment rules violated by this investment product? Two come to mind very quickly. First, understand the risks of a product before you invest. Second, respect the power of leverage. This instrument had been levered by a factor of two, which meant the return exposure on both the up and downside was doubled. We do not know if the investors in this case fully understood the risks they were getting into at the outset, but the desperate actions of the sponsors suggest that even they might not have really appreciated the perilous nature of their products . By the end of the week another firm that had issued a similar type of security, was warning investors to exercise extreme caution when buying and selling these securities. Such “advice” is of little help to those investors already holding the product. Let’s hope those investors can still afford to make more considered investment decisions in the future. 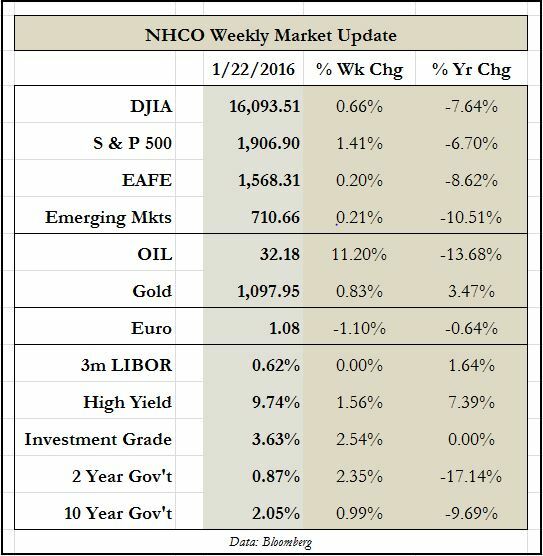 This entry was posted in The Weekly and tagged brokers, energy, leverage, MLPs on January 25, 2016 by nhoffmanandco.